SAN JOSE -- Bryan Little scored his second goal of the game 18 seconds into overtime, lifting the Winnipeg Jets to a 5-4 victory over the San Jose Sharks on Tuesday night. Joel Armia also scored twice and Mathieu Perreault had one goal to help the Jets win their third straight and fifth in the last seven. Connor Hellebuyck finished with 29 saves. Joe Pavelski, Logan Couture, Chris Tierney and Timo Meier scored for San Jose, which lost for the second time in seven games. Aaron Dell had 18 saves. Armia's second goal put the Jets ahead 4-3 with 8:22 remaining to play but Meier responded less than four minutes later for the Sharks. Marc-Edouard Vlasic's shot was blocked by Dustin Byfuglien, and Meier won the battle to the puck and slipped it past Hellebuyck. 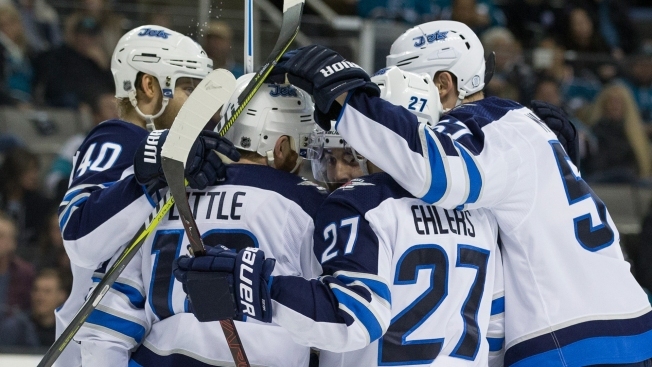 The Jets, who scored a goal apiece in each of its last four games, found the net three times in the first 12 minutes. Perreault set the tone, scoring 18 seconds into the game with an assist from Nikolaj Ehlers. Andrew Copp set up Armia's first goal with a terrific pass from the blue line less than five minutes into the game. Little scored on a power play, redirecting Tyler Myers shot past Dell to make it 3-0 with just over just over eight minutes left in the opening period. A heads up play from Pavelski put the Sharks on the scoreboard in the final minute of the first. Brenden Dillon's shot bounced hard off Hellebuyck's pads and Pavelski got to the rebound and fired in from 20 feet away. The Sharks tied the score with two goals within a four-minute stretch of the second period. Couture was trying to pass the puck midway through the period and flared on it. The puck floated between a pair of Jets' defenders as Couture spun around 360 degrees and found it sitting on open ice. He struck quickly, before the puck was located by anyone else. Tierney's power-play goal came after a sharp left-to-right pass across the ice by Joe Thornton. NOTES: The Jets improved to 23-1-4 when scoring first and 17-1-1 when leading after the first period. ... Tierney recorded his career-high 12th goal of the season. ... Perreault has three goals in his last four games. ... Pavelski has nine points in his last eight games. ... Thornton has nine points in his last seven games. Jets: At the Anaheim Ducks on Thursday. Sharks: Host the New York Rangers on Thursday.